My friend is doing battle with a slow growing cancer. She says it won’t kill her, but it’s definitely making her life uncomfortable. We stay in touch the usual modern ways… Facebook, texting and the occasional live meal. I love trading messages with her because she is always honest, ironic, generally optimistic, and quite funny. A few weeks ago, I loaded a Facebook post inviting friends to join me on a hike up to Manzanita Ridge. It’s a relatively challenging 8 mile hike from my home. The weather was promising rain and not surprisingly, no one took me up on the offer. The night before the hike, I receive this text: “If you think of it, do me a favor… post pictures of your hike tomorrow. I need some strong %^&, mother$#@&ing (yes, she does love colorful language) determination right now! I can’t do that stuff right now, but soon.” We chatted a bit more that night and while I was quite confident she is winning her battle, it is a HARD fight. I went to sleep with her on my mind. Since I didn’t get on trail until ridiculously late, I decided to just see how far and fast I could climb before the rain hit. I filled a bottle, threw on three layers, none waterproof (because I can’t melt, don’t you know), a baseball cap, grabbed my ID and a whistle (I’m not totally reckless) and took off. I left my phone at home, so no photos. My friend’s text was still in the back of my mind. I made excellent time to First Water because I thought I was being stalked. I’d passed an elderly gentleman early on, yet kept hearing his footsteps tailing me. I moved faster, trying to put some distance between us, but couldn’t shake him. Just before First Water, I heard an oddly familiar sound… I turned back to find a young man with his dog. Seems they’d been behind me the whole time and I’d just finally heard the dog breathing down my neck. HAHAHA! What on earth had I been thinking?! On the second leg to Orchard Camp, I wasn’t quite as peppy, having pushed so hard. I was slowing down, even stopping occasionally, and my head was starting to question the wisdom of the hike. The more I thought of my friend and how very easy I had it by comparison, the easier it became to quiet my mind and ignore the discomfort. By the time I’d reached the next destination, my head was firmly grounded in gratitude for my good health and body strong enough to experience the hike. I reached Orchard Camp knowing that the rain was due any minute and if I climbed the next 2 miles to Manzanita Ridge I’d be doing it in a cold rain. Instead I decided to just run back down the mountain and see how fast I could get to the bottom. That was the right decision, because as soon as I started back, it began to lightly rain. It could have been a nice sloppy, fun run down but I had a second agenda. I’ve been on the lookout for a long branch of manzanita deadfall to carve into a hiking pole. I wasn’t far out of Orchard when I found the perfect limb. She was about 7ft, thin, strong, nicely balanced and almost weightless. Perfectly fit and easy to run with, rain and all. Incidentally, I’d seen an equally lovely but much thicker branch of oak on my way up the mountain and had mulled the idea of bringing it home if I couldn’t find manzanita. 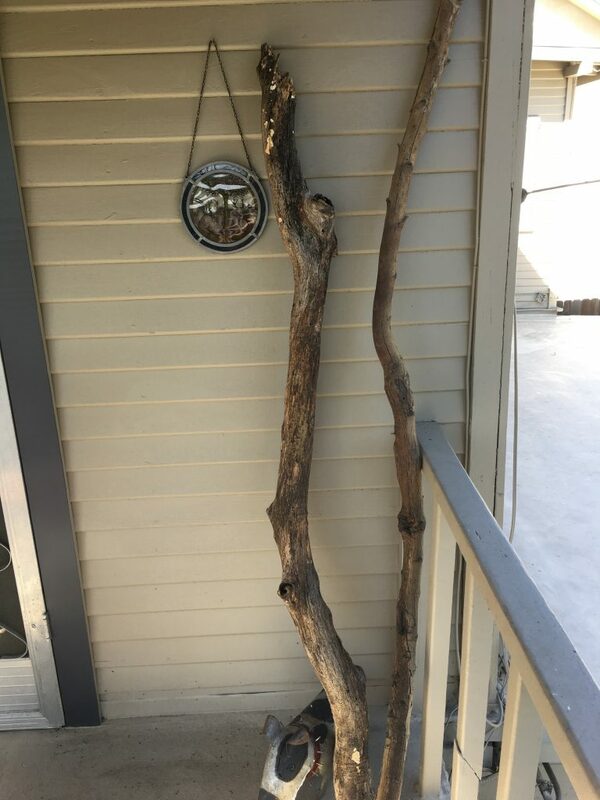 Since I no longer needed it and knew it would take a lot work work to uncover the walking stick in it, I fully intended to just run by. When I reached it, I realized I couldn’t leave it because I wanted to give it as a Christmas gift. Granted, the recipient of my gift hasn’t become apparent yet, I just knew that the branch needed to come home with me. Odd how we can know something so powerfully, yet not be able to explain why. Right then, everything changed. The new branch was unbalanced, heavy, wet and unwieldy. Oh, and now it was really raining. Still, I was highly motivated not just by the carving possibilities, but by the whopper of a story I’d have for my friend, assuming I could complete the task and get both sticks home. I knew that she’d see the silliness of my quest and probably laugh at me, yet hopefully feel a bit inspired for herself. She’s taken on a number of crazy challenges, so I knew she’d get a kick out of this one and that made all the difference. Between my intuition and the desire to please my friend, both branches were coming down no matter what. The two of them together were cumbersome and messy. There was no more moving fast since I had to keep stopping to swap them around and wipe rain off my glasses. Finally in a fit of frustration, I stuffed my glasses in a pocket and what do you know, I was able to see the ground and surroundings just fine. Seriously?! That was twice I’d been caught by my own assumptions in one morning! I could have put those branches down any time and just gone back for them another day. It would have been so easy. I kept thinking of my friend and everything that she lives with on a daily basis and how my little discomfort wasn’t even a blip on the radar of her day. That was enough to anchor my thoughts a potentially fun story in the making. As expected, she wholeheartedly laughed at me and I was very glad. We never ever know how our words and actions can affect others and there is nothing more important in this world than making someone else’s walk a little easier. So let’s all be brave, daring, and completely unreasonable. Then just maybe we’ll have the privilege and grace of touching the lives of those we love and maybe even those we don’t know.